You will be prompted to enter your company name whenever you install any of the Microsoft Office 2003, 2007 and 2010 software like Word, Excel, PowerPoint or Access for the first time. Most of us will provide a junk or invalid company name and complete the installation successfully but later realize the importance of this field since this company name will appear as a document properties in each document created by Microsoft Office. This article explains step by step process of changing the company name in Microsoft Office documents. Once you change the company name it will automatically reflect in all the Office packages like Excel and PowerPoint. The first step is to open registry editor. Click on Start > Run to open the box as shown in the picture beside. You can also use the keyboard shortcut “Windows button + R” to open the “Run” window. 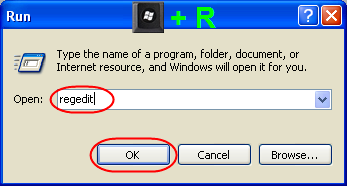 Enter “regedit” in the input box and click on “OK” button. In the registry editor navigate to the location “My Computer > HKEY_LOCAL_MACHINE > SOFTWARE > Microsoft > Windows > Current Version > Installer > Userdata > S-1-5-18 > Products > GUID > InstallProperties”. Under “Products” you can see lot of sub-options, each option is called GUID (Global Unique IDentifier) having sub-option of “InstallProperties”. Each installed Microsoft software on a computer will have one GUID and the name of the installed version will be shown in the variable “DisplayName”. Ensure to select the correct GUID and verify the DisplayName is showing the same version of your Microsoft Office pack. 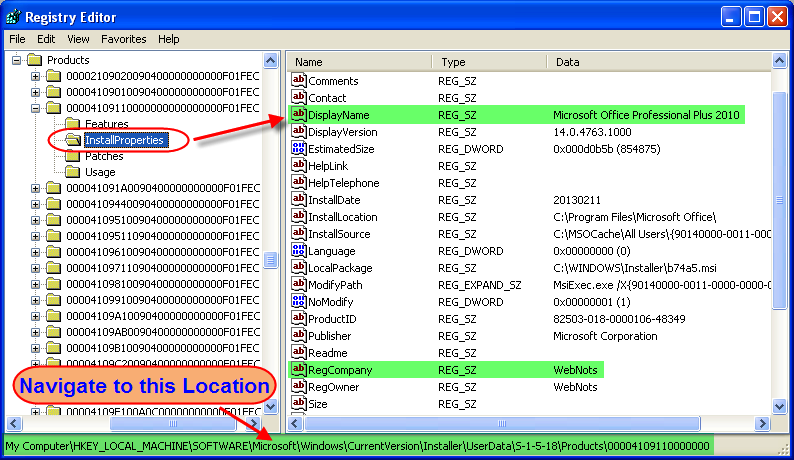 Below is the screenshot to select the correct GUID for “Microsoft Office Professional Plus 2010” installation. 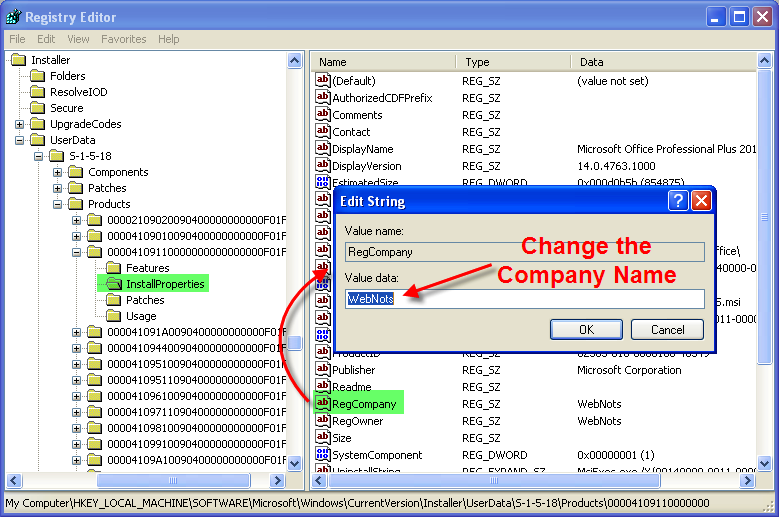 Once you identified the correct version showing in the DisplayName, then look for the another variable in the same page called “RegCompany” showing your existing company name. Double click on “RegCompany” to see a popup window where you can enter your new company name as shown in the below picture. Click on “OK” button and close the registry editor. 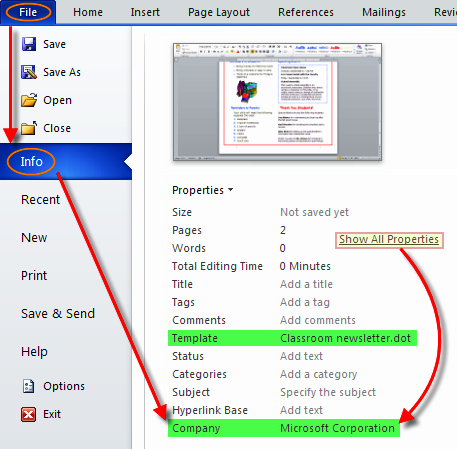 Open Word, Excel or PowerPoint and go to the option “File > Info > Properties > Show All Properties” in Office 2010 to see the company name is changed to the new name as you entered in the registry editor. The change will reflect only in the new blank document template called “Normal.dot” or “Normal.dotm” which will open by default. If you open any other new template document like Newsletters (available under File > New) the company name will be showing as per the template owner and not the name you entered in the registry editor. You can edit the company name directly in the “File > Info > Properties” for each template (except the blank document template) you want to change the company name. In this case ONLY the particular document property will be changed to the new company name and not the template, meaning you need to change the company name in each and every document. If you really wonder where the company name is stored in a document, here is an example. 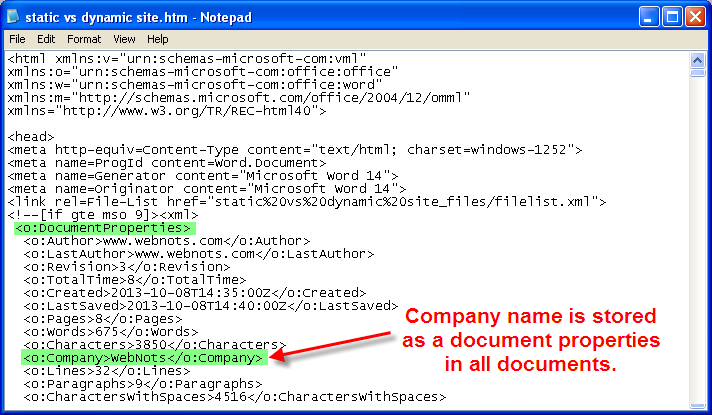 Save as any Word document with the option “Web Page (*.htm; *.html)” then open the document with your Notepad and you can see the company name is saved in the document as shown in the below picture.